Dax, my Seal Point Siamese had a favourite game when she was younger. She loved stringed beads, and would retrieve tossed ones for as long as I had the energy to play. When I had had enough, she would play toss and catch by herself, tossing the the beads in the air and then catching them. I don't know for sure, but it makes sense that she amused herself this way when home alone, since the beads were never where they were left in the morning when I came home after work. Sadly, Dax passed away (at the age of 17) last month. I miss her so very much, but the image of her bead-antics will always remain with me; and it will always bring a smile to me... sometimes, through the tears. Ellen, thank you so much for sharing your lovely photo of Dax and the story of her bead-catching antics. 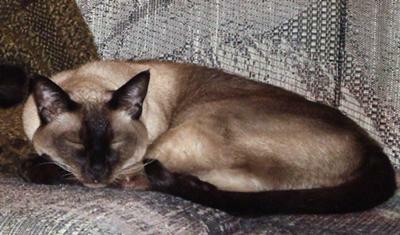 She was a gorgeous cat, a lovely example of a Seal Point, and I'm sure you must miss her terribly. It's always good to have memories like yours of her playing with and catching her beads, to remind you of the fun times. Thanks to both of you for your compliments about Dax, and for your words of comfort. I did look at Saffy's Webpage. Wonderful kitty! This a bit of coincidence. I now have a 10-year-old Tortie, named Sue-ling (Well, I call her Suzie.). I will submit a picture and her "story" separately. But I "rescued" her, as well; and it was mutual love at first sight. Oh, and yes, I am a Star Trek fan. Hi Susan, good to hear from you again. Thank you for your comment and I'm pleased to hear Saffy is getting on well. I'm sure she must be growing up really fast. Ellen, Susan found a seal point Siamese kitten on a day out to the local beach (the link to her page is in her post below). Do take a look at little Saphira! Thank you for sharing your stories of Dax with us! I just had to smile - as my friend too had a Dax! Jadzia Dax to be precise. [Her husband liked Star Trek!] I am glad you had such a lovely time with your beautiful Dax, and have all those wonderful memories. When the time is right .. you will have another little one ... who will make you mad and happy! Believe me .. after all those years... you will have forgotten JUST how mischievous a kitten can be!! Our Saphira is a seal point too ... is losing her baby teeth ... and biting and nibbling on everything, and chasing about the house like a mad thing !! lol! !